Make sure your track is release ready! Open the application and drag your audio onto the dashboard. EXPOSE will examine your track in detail, in order to discover if there are any issues that will result in your audio being degraded. In the bottom left corner you’ll see the presets. Click on the presets and select the one that best suits your playback scenario. The four sections give you detailed information about the loudness, peaks, stereo/phase information, and dynamic range of your audio. If EXPOSE detects that issues would arise, the section icon and problematic readout will turn red. The waveform will also show you the exact location of the issues. You just click on one of the numerical readouts to isolate those specific issues on the waveform. You can click on the waveform to preview that part of the audio. Once you’ve identified what and where the technical issues are you can efficiently solve them in your DAW. Press space bar to start and stop continuous playback. Use EXPOSE to get the perfect product for the playback format you are aiming your production at. EXPOSE is a standalone application for Mac and Windows computers. 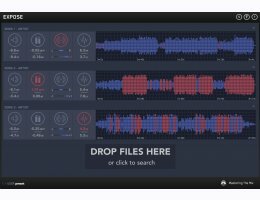 Request A 15 Day Demo Here to ensure your recordings sound as good as possible on any delivery format.